Therapy patients and fitness buffs of all ages will find a bright new facility in the Altru Performance Center, which recently opened in the former Scheels location in the Med Park Mall. Tucked into the inner corner of the L-shaped strip mall at South Columbia Road and 13th Avenue South, the center occupies about 40,000 square feet, said Chad Gerloff, facility project coordinator with Altru Health System. It’s the new location for physical, occupational, hand, speech and pediatric therapy services that were moved from the former rehab building just south of Altru Hospital, Gerloff said. t’s also the new home of Sports Advantage powered by EXPO, a fitness facility which is set to open Monday. At 10,000 square feet, this unit, formerly located at Altru’s campus on South Washington and 44th Avenue South, will have more equipment and services and twice the space it used to occupy, officials say. Remodeling of the former sporting goods store began in August. Altru holds a 10-year lease on the property, Gerloff said. Among other improvements, the design and location of the new facility make it easier for patients to access services, he said. Therapy for children is now “self-contained,” with more space dedicated to sensory therapies for kids, whether they need high or low levels of stimulation, she said. The pediatric therapy space features a state-of-the-art sensory gym that includes two rock climbing walls, a two-story play structure and zip-line equipment. “It’s an improvement over what we had,” Ophaug said. “We some of these things, but not all in one spot. Adult therapy patients will notice larger treatment rooms and more private areas for physical therapy. The large, well-lit adult gym occupies twice the space of its former location, Gerloff said. Mary Nygord of Grand Forks, who was in a therapy session Wednesday with physical therapist Kari Boese, said she was impressed with the new facility. “I used to have therapy at the old rehab hospital,” said Nygord, who is recovering from a hip injury. “I wondered how they were going to get everything there into this place, with all the equipment they have. “Now they have even more here, and all this room,” she said, looking around the expansive gym. In the lobby, the reception desk is backed by a curved floor-to-ceiling wall, open on the sides, that shields most of the waiting area from view, preserving the privacy of patients and visitors. A focus on environmental responsibility by reducing waste also was factored into the design plan, Gerloff said. This the first time walls of this type, which are made of up of 42.5 percent recycled material, have been used in an Altru property, he said. The wall panels are “preloaded” with electrical equipment; clocks can be imbedded in them. They can be printed with artwork in the factory, as requested by the client. Panels that feature the photography of Altru surgeon Dr. Brad Belluk are expected to arrive soon, Gerloff said. Two panels in the building have TV screens integrated in them. 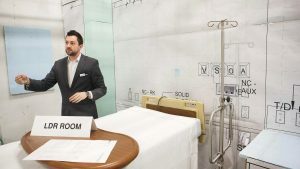 The center also includes a mock bedroom, bath and kitchen where patients can practice or relearn skills for daily living. There’s also a demonstration kitchen, part of the Sports Advantage center, where nutrition education is planned. It serves as the employee breakroom. Other Altru units that will move in later this spring are Yorhom rehabilitation technology equipment and supplies, the regional therapy services’ office and chiropractic services. An open house probably will take place this spring, Gerloff said, but a date has not been confirmed. The former rehab building will become the new home for departments and offices that were scattered to other locations after the former Altru Clinic building structure failed a few years ago and had to be demolished, he said. Those departments include obstetrics-gynecology, general surgery, wound and vascular services, physiatry, pulmonology, ultrasound and the Women’s Breast Center. “It will become what the Clinic was,” he said. Officials are assessing when to start, but work on remodeling the rehab building to accommodate those departments is expected to begin in the latter half of this year, and will vary by department, he said. The entire project should take between eight and 10 months to complete, he said.